DJH Roofing & Lead Work Specialists - Fascia/Soffits/Guttering, Roofer based in Goring-by-Sea, West Sussex. 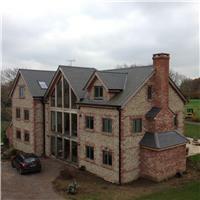 DJH Roofing & Leadwork Specialists have over 20 years experience in all aspects of specialists roofing. My team are fully trained in all aspects of roofing and are very hard working honest guys that are very passionate about their jobs. We are relatively new to Checkatrade, 90% of our work comes from recommendations,so joining Checkatrade was perfect for us. None of our work is subcontracted out to anyone due to our high standards & work ethic. We are fully qualified in Premier GRP systems, single ply membranes and specialist lead works which sets us apart. We cover all of the Sussex and Surrey areas & we do on occasion travel as far as London.